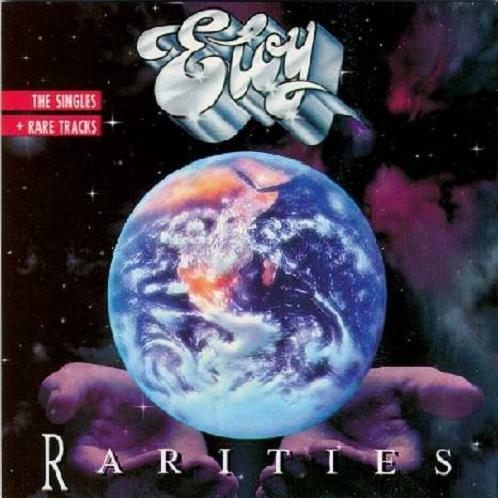 "Eloy" didn't release any new studio album between 1988 and 1992. It was maybe the kick for their label to release these "Rarities". Several songs do have an historical interest but not more. It is the case of "Daybreak" as well as "On The Road". Good old "Eloy" songs. Fully psychedelic. Both were released on the remastered version of their debut album. The most interesting is "Let the Sun Rise in Your Brain". It is one of their few (if not only) "Tull" oriented songs. This flavour is provided with a good fluting break. IMO, it is one the best number from this complilation. I also lilke very much "Through a Somber Galaxy". The great guitar solo is fully Floydian and it was one of the very few good songs from "Time to Turn". This version has been edited slightly (almost one minute). There are two additional songs from this abum as well but they are really painful : "Wings of Vision" and the title track "Time to Turn" (even featured twice here)! These single (or extended version) won't do any good. Their album "Colours" which I didn't really appreciate will provide the core of this album. Four numbers actually : "Child Migration ", "Horizons", "Silhouette", and "Sunset" which was one of my fave from this average album. This collection of songs is by no means of deep interest. Just a couple really deserves any attention. Two stars.